Rain has come down after more than a week of heavy to moderate rainfall, since the beginning of northeast monsoon the weather is awesome cool. Last Thursday (Nov 2) the rain touched its peak of 300mm, creating a feel/fear of flooding, though the suburbs witnessed floodwater due to low-lying landscape, the city recedes to normal in a day or two. Marina Beach, which has been the downpour at core, continued to lie under flood water for and we received water up to our doorstep but glad the water doesn’t enter the home. Though not fully, the corporation had done a bit by cleaning at least around the manholes of stormwater drain to let in water and the ramp we built at the entrance of the house prevented the entry of street water. It was one of the long lasted rains for Chennai after long time and the rains of Monday (Oct 30) and Thursday was heaviest to create temporary pools. The weather doesn’t turn only cooler but also caught cold in me. It’s giving immense trouble lately and I’m on medicine for a week now, but still couldn’t come out clearly. I haven’t caught cold in last two years and I took pride about it, but the recent change in weather and other causes has put down the grade! Lol... Spitting and snuffling continue to irritate me and kept me away from online activities including blogging. I read no blog all these days and obviously no update too… but was on Facebook for rain updates and news relevant to same. Glad the rain decided to take break which sure will help water recede in the suburbs or aid authorities to take further steps, and really need to say the govt. worked better than previous flooding, but still it wasn’t enough. Wish they make certain all the channels are clear so that it won’t be a disaster monsoon. No doubt that we need rains, and draining/storing the water properly is quite important. 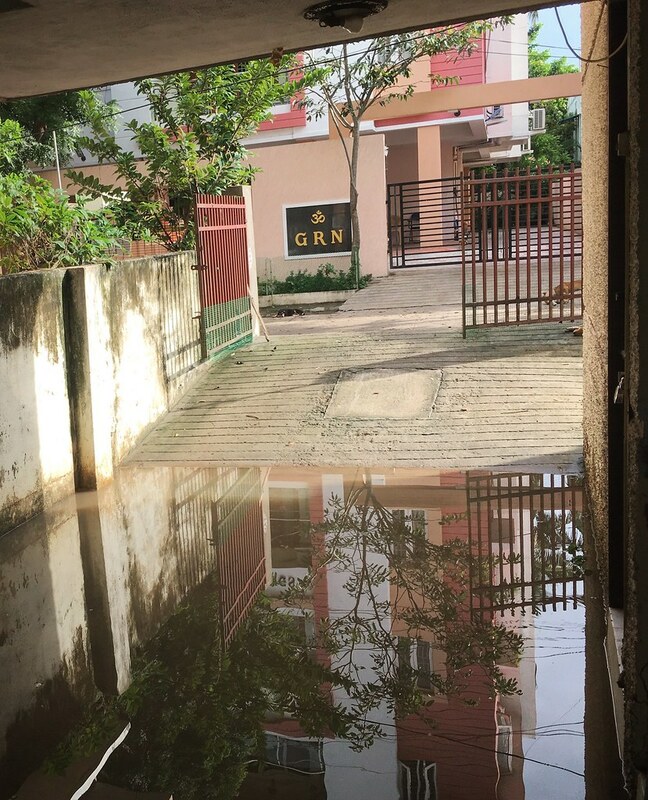 Reflection in rainwater: Picture captured through the stagnant water into our courtyard and it was shot when the water receded almost... on the bottom of the compound wall in left, you could see a line which marks the water level rises inside. I'm grateful the water didn't get in your home. So sorry you've been feeling sick. I hope the medication has been doing its job and you're back to 100% soon. We had the same issues with the city and drainage. They had to come clear a lot of our sewers of leaves and other items to try to alleviate some of the flooding issues we have but it didn't help much. People still blow their yard debris into the storm drains. If this rain had not come, it would have been a drought for the next year. This rain is the city's saviour. I’m sorry to hear about your cold — I hope it soon goes away and you are feeling better. We’ve had quite a bit of rain here over the past few days, but nothing like you’ve been experiencing. Oh yes torrential rains in Tamil Nadu was in the news as well as the political developments. Have enough lukewarm water with or without some drops of lemon juice to help the system to flush out toxins. Hope you'll be better soon. Rains are always welcome and flooding is not due to rain but becuase of corruption as all the drain covered, rivers have turned into multistoreys..so we have to check that. I like the reflection, even in the midst of the storm! Hope you are feeling better. My kids have been sniffly too. I hope you are doing well. Rain was a welcome break from heat in spite of havoc it created. I hope you have recovered. Its been raining for the past few weeks and certain states were badly flooded. I have been wondering how your were dealing with the monsoons. You re surviving it but I am sure it really is inconvenient. We take our sever storms in stride and I am sure you have taken the monsoons the same way as they come each year. Take care. I am sure you read news that my hometown was under severe floods after the typhoon swept through. It was the first time they had such a big scale of flooding. I like the reflections of your photo. So creative like a story book.